Personal steam saunas or tents like the one pictured here are the most affordable portable sauna you can buy anywhere in the USA. For about $300 or less, you can have everything you really need to generate steam heat and detoxify your body. These kits come with a the steam "tent", the steam "generator", a chair to sit on and a foot massager to keep your feet busy. Personal steam saunas like this are perfect for small rooms or apartments because everything tucks away easily in a closet or under the bed. This sauna option is not the coolest looking set up, but gets the job done in the privacy of your own home and is great for the body wrap soaking period. The next most affordable portable sauna available on the market today are far-infrared sauna blankets similar to the one shown here. Far-infrared technology uses a different type of heat to bring your body temperature up to 70 degrees Fahrenheit so your body releases toxins and oils from your skin and pores. These sauna blankets fold away neatly so they have the advantage of being space savers and affordable. Prices of sauna blankets can range from $400, for the model pictured here, to over $3,000 for the FIT Bodywrap System. They all appear to function the same to me, so less expensive is probably better in this case. 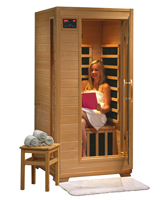 The next step up in personal and portable saunas are the single and multi-person saunas like the one pictured. From here on, portable saunas begin to weigh much more and become quite difficult to move, but yet not permanent and sometimes have wheels, and therefore considered portable. The sauna pictured here is a one person FAR Infrared sauna with carbon heaters, LED control panel, and built-in stereo and speakers with MP3 hookup. This particular model features 5 carbon heaters, FAR heaters put out between 5 and 12 microns and can raise temperatures to 141 degrees Fahrenheit on 1295 watts of power. The dimensions of 36" wide and 75" tall allow this unit to be placed comfortably in any room in the house. Prices range from $1,500 to $6,000 for multi-person versions with same features. We sell this Buena Vista model new for $1,499 with free shipping anywhere in the USA. Call 800-667-9189 or email us here with questions. As seen on Oprah and Dr Oz.